The Delaware-Lackawanna Railroad is a fascinating 88 mile Shortline that's located in Northeastern Pennsylvania. See exciting Alco powered road freights as they travel the steep grades across the scenic Pocono Sub and along the River Valley of the mountainous Delaware Water Gap before reaching a connection with the NS at Slateford Jct. This rail line also features several former Delaware Lackawanna & Western towers and passenger stations. The D-L rail operations are based out of Scranton, PA and is part of the GVT System. At Scranton see locals and switching in the Steamtown yard. 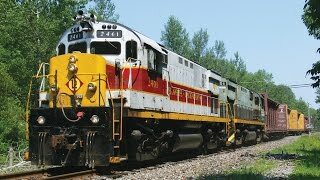 There's plenty of great Alco sound and smoke in this action packed DVD featuring diesel models: RS3, RS11, RS32, C420, C425, M420, M630, M636, and C636. Plus steam powered passenger excursions that run out of the Steamtown National Historic Site and feature CN #3254 a 2-8-2 and CP#2317 a 2-8-0. Shot from the cameras of Brad Plets and Rob Pisani. Footage era 2005-2009.